The problem of a coinage that didn't circulate plagued the Mint since the turn of the century, and was rooted in the Coinage Act of 1792. Shortly after Congress established a bimetallic system with a fixed ratio of 15:1 for silver to gold, the wars in Europe pushed up the world price of gold right along with Napoleon's fortunes. Speculators and bullion brokers began to buy U.S. gold coins, exporting them for large profits. During the War of 1812, the "unofficial" ratio continued to widen, and later, expanded more with the tremendous output of Mexican and South American silver mines. Except for half dollars, most of which sat as bank reserves, U.S. coins were nowhere to be found. Commerce was left to function with an assortment of Spanish reals, "wildcat" banknotes and fractional currency. Lacking a solution, Congress ignored the problem for decades, but actually their choices were limited. Constantly adjusting the metal content of the coins as prices fluctuated was not an option, as coins of varying weights could not compete. Heavier coins would be melted and lighter ones spent. Lowering the amount of gold in the coins was also proposed, but always rejected as debasing the coinage. By 1829, the steady drain of gold from the nation and the deplorable currency situation finally forced Congress to begin serious work on reform. A number of bills were introduced, with proposals ranging from scrapping the bimetallic system in favor of a silver standard, to a dual-subsidiary system with heavily debased coins. Debate was extended and often bitter, and everyone from Treasury officials to Southern gold mining interests were heard. All saw the need for a viable, circulating coinage, but few agreed on the means to reach the goal. After four years, a compromise was struck, one that certainly benefitted the mine owners but also the country and commerce as a whole. Although the bill debased gold coinage by approximately 6% and effectively put the U.S. on a gold standard, it was a major success in achieving its objective: Gold coins were back in circulation again. At the time of the Act of 1834's passage, only two gold denominations were in current production, the half eagle and quarter eagle, both with Engraver William Kneass' Capped Head design. Recognizing that older gold coins would now be turned in for recoining (the old-tenor quarter eagle now had a value of $2.66), Mint Director Samuel Moore instructed Kneass to prepare dies for a new design. 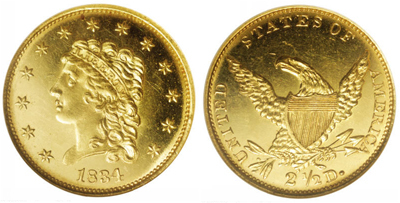 Kneass, pressed for time, chose to borrow John Reich's "Classic Head" design from the large cents of 1808-14 and the eagle from his gold coins of 1807. Kneass' adaptation depicted Reich's androgynous Liberty facing left, her curly hair cascading down the back of her neck, tied by a headband inscribed with LIBERTY. Thirteen stars surround the bust, with the date below. The reverse features an eagle perched on an olive branch and clutching three arrows, encircled by UNITED STATES OF AMERICA and 2 ½ D. As the design was similar to the previous Capped Head motif, officials decided to delete the motto E PLURIBUS UNUM, providing the public with an easy way to distinguish the new, lighter-weight pieces. Modifications were made to the design from the very beginning, first by Kneass, later by his successor, Christian Gobrecht. The 1834 issues were struck with two different heads, characterized by collectors as the "Small Head" and "Booby Head." The 1835 coins show a taller, thinner bust. After Kneass suffered a stroke in 1835, Gobrecht continually experimented with improving and strengthening the design, making minor changes each year, none of which proved to be an improvement. Classic Head quarter eagles are readily available in all grades through XF but are quite elusive in mint-state and rare in gem condition, as most coins went immediately into circulation and saw heavy use. The 1834 and '36 issues appear most frequently in high grade, and occasionally in proof. Although the 1835 and 1837 issues exist in proof, mintages were infinitesimal, and survivors are exceedingly rare. Uncirculated coins from the branch mints are the real "stoppers" of the series, particularly the low-mintage (rare in any grade) 1838-C. Assembling a complete date and mint set of this series is a formidable challenge, particularly in mint state, limiting most collectors to just one high-grade "type" example for their sets. When grading this design, wear first appears on the hair above Liberty's eye and ear, on her cheek, and on the eagle's wings. Branch mint issues often come very weakly struck and should be graded accordingly. Many pieces were used for jewelry and may show evidence of retooling or solder removal. Ironically, although gold coins returned to circulation after the Mint Act of 1834, small change was still not available for commerce. Quarter eagles were the equivalent of $50 in today's purchasing power, and they helped little in everyday transactions. Silver coins would not become commonplace until 1853, when Congress made fiduciary coins out of the smaller silver issues. In 1871, the Supreme Court looked back at this era and denounced the Act of 1834 as a violation of the Fifth Amendment to the Constitution. As the Act allowed debts to be paid with 6 percent less gold, the Court viewed it as seizing private property for public use without just compensation. In 1840, after years of modifying and tweaking the existing designs, Gobrecht's new Coronet Head was adopted for the quarter eagle. First used on the eagle in 1838 and the half eagle in 1839, it would remain on U.S. gold until 1908, when it was replaced by Augustus Saint Gauden's Indian Head motif. BIBLIOGRAPHY: Akers, David W., United States Gold Coins, Volume II, Quarter Eagles 1796-1929, Paramount Publications, Englewood, OH, 1975. Breen, Walter, Walter Breen's Complete Encyclopedia of U.S. and Colonial Coins, F.C.I. Doubleday, New York, 1988. Carothers, Neil, Fractional Money, A History of Small Coins and Fractional Paper Currency of the United States, John Wiley & Sons, London, 1930. Taxay, Don, The U.S. Mint and Coinage, Arco Publishing Co., New York, 1966. Winter, Douglas, Gold Coins of the Charlotte Mint 1838-1861, DWN Publishing, Dallas, 1998. Winter, Douglas, Gold Coins of the Dahlonega Mint 1838-1861, DWN Publishing, Dallas, 1997. Winter, Douglas, New Orleans Mint Gold Coins 1839-1909, Bowers and Merena Galleries, Wolfeboro, NH, 1992.